MURTAJILL 2 wins at 2, A$646,375, AJC Skyline S., Gr.3, 1200m-in track record time, Breeders' P., L, 2d AJC All Aged S., Gr.1, BTC Doomben Ten Thousand S., Gr.1, STC Hobartville S., Gr.2, 3d VRC Gilgai S., Gr.2, STC Silver Slipper S., Gr.2, AJC Eskimo Prince S., L, 4th STC Golden Slipper S., Gr.1, AJC Sires' Produce S., Gr.1, MRC Sir Rupert Clarke S., Gr.1, HDF McNeil S., Gr.3. He entered stud in Aust. in 2009. Sire of 258 progeny to race, 149 winners (57.0%), earnings of over $9.6 million, 1 stakes winner, 8 stakes placegetters, inc.
SUNSHINE MIGHTY (10g, Verglas, River Mist). 6 wins to 1500m, Macau Lisboa Challenge, L, 2d Macau Race Horse Owners Association Cup. Murt the Flirt (11g, Taimazov, Kenmare). 4 wins to 1400m, A$379,400, Ballarat TC Magic Millions 3 & 4YO Classic, Magic Millions 3YO Classic, MRC Movenpick Ice Cream H., 2d Ipswich TC GA $10 TIX H., 3d MRC Sir John Monash S., Gr.3, GCTC Magic Millions Sprint, Wyong Magic Millions S., BRC PMP Limited BRC P., 4th GCTC Magic Millions Cup, RL. Girlsarebackintown (12f, Carnegie, Vice Regal). Winner at 1100m, 2d Taranaki RC ITM Winstones Wallboards H., 3d Taranaki 2YO Classic, Gr.3, ARC Champagne S., L, Waikato RC NZB Insurance Pearl Series 2YO S.
Murtle Turtle (10f, Last Tycoon, Final Card). Winner at 2, A$96,620, SAJC Protect Your Neck 2YO P., 2d SAJC Breeders' S., Gr.3, Sires' Produce S., Gr.3, Myer Fashion Trophy, Centrebet 2YO P., Pauls Milk H., Medallion Homes H., 3d SAJC Phyllis Harris Celebrating 90 Years H., Boag's Draught H., 4th SAJC Sportingbet S., L.
Kronfeld (10g, Stravinsky, Zabeel). 8 wins from 1400m to 2150m, A$147,715, 3d Kalgoorlie Cup, L.
Seenaan - Jay Eff Express (Sing.) (11g, Zabeel, Centaine). 7 wins-1 at 2-to 1400m, A$71,000, S$290,885, VRC Taj Rossi 2YO Series Heat P., Singapore TC Charity S., Benchmark 97 H., Trigger Express S., Class 3 H., Class 4 H., 2d Singapore TC EW Barker Trophy, L, Class 4 H.
Our Rock O'Reilly (11g, O'Reilly, Prince Echo). 3 wins-1 at 2-at 1000m, 1200m to 2018-19, A$77,200, BRC Watpac Specialty Services 2YO H., 3d BRC The Phoenix S., L, Winningedge.net.au 2YO H., Suez H.
Shamurt (15f, Shamardal, Best Western). 2 wins at 2 in 2017-18, A$208,325, BRC Mandate 2YO H., Toowoomba TC Spirit of Boom 2YO H., 2d BRC Dalrello S., L, 3d BRC Ray White Ascot H.
Essie's Pride (10f, Last Tycoon, Millionaire). 2 wins at 1200m, 1400m, 3d VRC Talindert S., L.
Grey Countess (10f, Geiger Counter, Voodoo Rhythm). 7 wins-1 at 2-to 1300m, A$147,075, BRC XXXX Gold 2YO H., Navaska H., 2d BRC Powerade 2YO H., Ordanga Properties 2YO H., LED Superscreens H., Toowoomba TC Neil Mansell Transport H.
Rumeron (11f, More Than Ready, Lake Coniston). 5 wins to 1400m, A$107,433, TTC Magic Millions 3YO Classic, TRC Rudolph the Reindeer H., Lyden Builders H., 2d TTC Magic Millions 2YO Classic, 3d TRC Schweppes H.
Rock Forthe Ladies (11g, Tale of the Cat, Zabeel). 5 wins from 1200m to 1600m, A$226,900, ATC Filante H., MVRC Subzero Greys Challenge H., MRC Grand Hotel Frankston H., 2d SCTC North Shore Realty P., Bendigo JC All Seasons Hotel H., 3d ATC Sensis Dash H., Echuca Cup. Femmette (11f, Surtee, Agincourt). Winner at 2, WATC Westspeed 2YO P., 2d WATC Westspeed 2YO P., 3d WATC Westspeed H.
Abu Ben Adam (10g, Rory's Jester, Sir Tristram). 10 wins-1 at 2-from 1200m to 1650m, A$249,710, BRC Hillross Montefiore & Company H., Teece Air Conditioning 2YO P., GCTC Tattsbet H., 2d BRC Canadian Club H., Quest Breakfast Creek H., Channel Seven H., SCTC Skyharness H., Rockhampton JC Capricornian Community Owned Bank P., 3d BRC HLB Mann Judd H., 4th Sunshine Coast Cup, L.
Murvate (10g, More Than Ready, Fairy King). 7 wins to 1400m to 2017-18, A$136,395, ATC Tab.com.au H., 2d ATC TAB Rewards H., 3d ATC Nick Falzon H., Cellarbrations H.
Ariconte (12g, Twining, Dr Grace). 5 wins-1 at 2-to 1400m to 2017-18, A$81,025, TTC National Apprentice Series Heat 4 H., 2d TTC Bill Dunstone Memorial H., Devonport RC Peppermint Parties H., 3d TRC Elwick Functions & Events H., Rogerson & Birch Surveyors H., TTC Tas Hotel & Club Supplies H., Devonport RC Simons Design Centre H., Dannebrog H.
Back in Black (11g, Generous, Nanutarra). 5 wins at 1000m, 1200m, HK$4,391,700, HKJC Craigengower Challenge Cup, So Kon Po H., Matheson H., Arc de Triomphe Champions H., High Island H., 2d HKJC Tai Hang Tung H., Siu Ma Shan H., Broom H., 3d HKJC Fortress Hill H., Golf Club Centenary Cup. Esgrimidor (10g, Orpen, Almurtajaz). 5 wins to 1200m, A$129,845, ATC TFE Hotels H., 2d ATC Pacific Plumbing H.
Miss Swindle (13f, Royal Academy, Mister C). 4 wins at 1000m, 1200m to 2018-19, WATC Fifth Leg H., 2d WATC Get the Tabtouch H., Ascend Sales Trophies H., Get the Tabtouch P., 3d WATC Carbine Club Rick Hart H., Seacorp H.
Camouflage (12g, Zeditave, Gielgud). 4 wins to 1350m, Ipswich TC Labour Day H., 2d BRC Christmas Carnival H.-twice. Murti (12g, Starcraft, Grand Lodge). 4 wins to 1250m, SAJC MAC Stop Drug Driving H., Craig Fitzgerald H., 2d SAJC MAC Stop Drug Driving H., 3d SAJC Adelaide Galvanising H., James Boag's Premium H.
Murtle Miss (10f, Fraar, Rory's Jester). 4 wins to 1550m, BRC Sequalo at Lyndhurst H., Rockhampton JC Breast Cancer Fundraising H., Coca Cola Amatil H., 3d BRC Channel Seven P., Hidden Dragon at Lyndhurst P., Mount Franklin P., Rockhampton JC Racing Awards 29/8 H.
Flying Murty (13g, Hawk Wing, King of Kings). 3 wins at 1000m, 1400m in 2017-18, A$90,100, MRC Next Payments H.
Geodude - Monica (H.K.) (13g, Encosta de Lago, Zoffany). 3 wins at 1400m, 1500m to 2018-19, HKJC Lukfook Dear Q Collection H., 3d HKJC Severn H.
Adjourned (12f, Legal Opinion, Creag-An-Sgor). 3 wins at 1350m, 1450m to 2017-18, Ipswich TC Qld Times H.
Grey Rock (11g, Snippets, Rancho Ruler). 3 wins from 1350m to 1650m, Ipswich TC Cup Marquees Selling Now H., 2d Ipswich TC Marriage is A H., SCTC Wimmers Premium Soft Drinks P.
Galway Town (10f, Royal Academy, Snippets). 3 wins at 800m, 1350m, Ipswich TC Remax A1 Property Services H.
Ramaadi Bullet (13g, Canadian Silver, Danzatore). 2 wins at 1400m, 1600m to 2018-19, TTC Tradies & Ladies P., 2d TTC Henry's Restaurant H., 3d TRC Gee Gees Horse Stud P., TTC TG Johnston H.
Glistening Star (12f, Famous Star, Sovereign Edition). 2 wins at 1150m, 1400m, TRC Dodges Ferry Sharks H., 2d TRC NBCF Zero Deaths H.
Ivy's Gold (12f, Lonhro, Alquoz). 2 wins at 1400m, 1550m, Waikato RC J Swap H., 2d Waikato RC Diamond Lodge Draft H.
ROCK OF GIBRALTAR (IRE) (Bay 1999-Stud 2003). 10 wins-5 at 2, The Two Thousand Guineas, Gr.1. Sire of 2076 rnrs, 1333 wnrs, 130 SW, inc. Prince Gibraltar (Baden-Baden Grosser Preis von Baden, Gr.1), Eagle Mountain, Quarteto de Cordas, Alboran Sea, Varenar, Society Rock, Diamondrella, Gibraltar Point, Samitar, Europa Point, Mount Nelson, Admiral, Seventh Rock, Brillo de Sol, Cascada Sureña, Rock Kingdom, Ajaxana, Belle de Crecy, Gibraltar Blue, etc. MURTAJILL (c by Rock of Gibraltar (Ire)) 2 wins. See below. SUNSET RUN (g by End Sweep (USA)) 7 wins-1 at 2-to 1300m, A$241,160, AJC June S., L, STC Luskin Star H., Rotary & The Community H., Rosetti & Stone Welter H., AJC IGA Welter H., STC Hyland Race Colours H., 2d STC Cadbury Schweppes H., Foundation Series H., Frank Dowling Memorial H., AJC Thrifty H., STC Sydney Mitsubishi H., 3d STC Maurice McCarten S., L, AJC Tullamax Welter H., STC Australia Day Welter H., Maurice Blackburn Whyburns Legal H., 4th AJC Razor Sharp H., L.
BRADBURY'S LUCK (c by Redoute's Choice) 2 wins at 2, A$630,073, GCTC Magic Millions 2YO Classic S., RL, AJC Canonbury S., L, 3d MRC Blue Diamond Prelude (c&g), Gr.3. Sire. Thegreatandthegood (g by Rock of Gibraltar (Ire)) 6 wins from 1200m to 1600m, A$81,240, BRC Nathan Lawyers Ascot P., 3d MRC Blue Diamond Prelude (c&g), Gr.3. Avalanches (g Street Cry) 7 wins-1 at 2-from 1300m to 1800m, A$189,795, Ipswich TC Optus Business Direct H., 2d BRC Gunsynd Classic, Gr.3, GCTC Stuart James Memorial H., Bartercard H., Fat Lady Has Sung H., Ipswich TC Sub-Branch RSL H., 3d GCTC Garrards Horse & Hound H.
Palm Trilogy (g Dubai Destination) 8 wins-1 at 2-from 1300m to 2050m in Aust. and Macau, Macau Summer Sand Challenge H., Asuncion H., El Gran Senor H., 2d Macau Star of the Sand S., L, Norfolk H., 3d MRC Eleven Cath White Memorial H., Macau Musket H., 4th VRC Fashion S., L, Macau Derby, L.
Sastruga. 4 wins to 1500m, A$105,310, ATC Horsepower Sweetfeed No 4 H., Wollongong Dental Ceramics H., 3d ATC Flinders Lane Perfect Fit Shirt H. Producer. Allision. 2 wins at 1600m, 1900m, ATC McGrath Estate Agents H., 2d ATC Pluck at Vinery H., McGrath Estate Agents H., 3d ATC Significant 2YO Prelude. TENLEY (f Medaglia d'Oro) 3 wins at 2, A$312,950, in 2018-19, ATC Reisling S., Gr.2, Pierro 2YO P., Twilights Return 2YO P.
Tordean (g by Naturalism (NZ)) 9 wins from 1100m to 1800m, A$106,515, SAJC Rory's Jester H., 2d SAJC Razzle Dazzle H., Club Ten 3YO H., Go Christmas Racing H., 3d SAJC Da Costa P., L, Pride of Ingenue H., Tabcorp H., Empire Ridge 2YO H.
VANCOUVER (c Medaglia d'Oro) Champion 2YO Colt in Australia in 2014-15. 4 wins at 2, A$2,368,250, ATC Golden Slipper S., Gr.1, Todman S., Gr.2, Canonbury S., Gr.3, Breeders' P., L, 4th ATC San Domenico S., Gr.3. JUSTE MOMENTE (f Giant's Causeway) 6 wins-2 at 2-from 1000m to 1600m, A$566,125, SAJC Robert Sangster S., Gr.1, VRC Maybe Mahal P., L, TCL Electronics H., Zouki Enterprise 2YO P., MVRC Leilani Classic, MRC Acorn 2YO H., 2d MRC How Now S., Gr.3, SAJC Laelia S., L, VRC Rainbird H., 3d MRC WW Cockram S., Gr.3, 4th BTC Doomben Ten Thousand S., Gr.1, MRC Tranquil Star S., Gr.3. CAPTAIN COLTISH (c Fusaichi Pegasus) 5 wins at 1200m, 1400m, A$177,076, VRC Chubb S., L, MVRC Essendon Mazda H., Mornington RC Ron Casey Memorial H., 2d VRC Schweppes H., MRC Beau Sovereign H., Kenvain H., 3d Mornington RC Hareeba S., L. Sire. Sweet Bean. 8 wins at 1800m, 2200m, HK$5,025,850, to 2018-19, HKJC Yau Tong H., Ng Tung River H., Yau Kom Tau H., Man Cheung H., Kwoon Chung Motors H., Bellflower H., Sha Tin Park H., O'Brien H., 2d HKJC Caroline Hill H., Fa Hui H., HKU Faculties of Business H., Swan H., Silvermine Bay H., Yau Tong H., Yi Tung Shan H., Celosia H., 3d HKJC Wa Mei Shan H., Cineraria H., Rose H., Hoi Pa H., Heung Yip H., Wang Tak H., HKU Faculties of Dentistry H.
Lightning Drew. 7 wins from 1350m to 1600m, A$131,005, Oakbank RC Mac Just Over H., 2d SAJC Freeman Wauchope Timber H., 3d SAJC Pure Envy Jewellers H., Oakbank RC Barry Biggs Memorial H.
Speedskater. 6 wins to 1550m, A$83,455, STC Freeway Hotel Super TAB P., 3d STC Grumpy's Welter H.
Wah May Star. 5 wins-1 at 2-at 1200m, 1400m, HK$4,890,000, HKJC Kranji H., Partnering for Community H., Hau Wong H., Electronic Unicorn H., New Territories West H., 2d HKJC Blog the World H., Guildford H., Chevalier Senior Housing H., Empowering the Youth P., 3d HKJC Lai Chi Chong H., Citibank Insurance Service H., Lion City H., Griffin Trophy, Heather H.
Iceskates. 4 wins from 1200m to 1600m, WRC ZM H., 2d STC Theraces.com.au H., Epic Wright Heaton P., CJC Vernon & Vazey Truck Parts H., 3d WRC Curtis McLean H.
Newlands (c High Chaparral) 2 wins-1 at 2-at 1400m, 1600m, R297,294, Kenilworth Racing It's a Rush H., 2d Kenilworth Politician S., Gr.3, 3d Kenilworth Langerman H., Gr.3, 4th Kenilworth Cape Derby, Gr.1. Petrenko (g by Exceed and Excel) 2 wins at 1200m, 3d MRC Hydrogen H., BRC Myer H.
Toulouse. 2 wins at 2, A$147,112, in 2017-18, ATC Half Yearly Membership 2YO H., Australian Turf Club 2YO H., 3d ATC Book Summer Hospitality 2YO P.
Grey Skates (g by Rock of Gibraltar (Ire)) Winner at 1100m in Aust. ZAUBERIN (f Zabeel) 4 wins from 1500m to 1800m, A$218,918, SAJC Tokyo City Cup, L, VRC Flood Appeal H., MVRC Big 6 H., 2d SAJC Port Adelaide Cup, L, MRC Winning Edge Presentations H., Moe Cup, 3d Bendigo Cup, L, 4th SAJC Lord Reims S., Gr.3, Warrnambool Cup, L. Producer. World Thoroughbred Ranking: 115 (in 2008). ROCK OF GIBRALTAR Horse of the Year & Champion 3YO Colt in Europe in 2002. Champion 3YO Miler in France, GB & Ireland in 2002. Head of The 2002 International 3YO Classification. 10 wins-5 at 2-from 1000m to 1600m, £751,213, €409,031, 1,250,000fr., US$214,000, Longchamp Grand Criterium, Gr.1, Royal Ascot St James's Palace S., Gr.1, Goodwood Sussex S., Gr.1, Newmarket Dewhurst S., Gr.1, Irish Two Thousand Guineas, Gr.1, The Two Thousand Guineas, Gr.1, Prix du Moulin de Longchamp, Gr.1, York Gimcrack S., Gr.2, Curragh Railway S., Gr.3, First Flier 2YO S., 2d Breeders' Cup Mile, Gr.1, Doncaster Champagne S., Gr.2. He entered stud in Ireland in 2003. 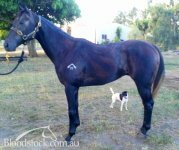 He entered stud in Aust. in 2003. Sire of 2076 progeny to race, 1333 winners (64.0%), earnings of over $126 million, 130 stakes winners, 113 stakes placegetters, inc.
ALBORAN SEA (11f, Toolighttoquit, Northern Answer). Champion 3YO Filly in South Africa in 2014-15.5 wins-2 at 2-at 1000m, 1200m, R2,062,250, Scottsville Allan Robertson Championship, Gr.1, Kenilworth Cape Flying Championship, Gr.1, Turffontein Computaform Sprint H., Gr.1, Sun International P., 2d Greyville Golden Slipper, Gr.1, Scottsville South African Fillies Sprint, Gr.1, Kenilworth Southern Cross S., Gr.2. DIAMONDRELLA (04f, Dixieland Band, Miswaki). 8 wins from 5f to 1m, US$825,808, Belmont Just a Game S., Gr.1, Keeneland First Lady S., Gr.1, Belmont Xtra Heat H., L, Keeneland Giant's Causeway S., L, Belmont Positive Gal S., L, Allowance, 3d Hollywood Park Matriarch S., Gr.1. SOCIETY ROCK (07c, Key of Luck, Ela-Mana-Mou). 6 wins-2 at 2-at 6f, £994,463, €57,150, Royal Ascot Golden Jubilee S., Gr.1, Haydock Sprint Cup, Gr.1, York Duke of York S., Gr.2, Ascot Pavilion S., L, Newmarket Tattersalls Timeform Millions 2YO S., 2d Newmarket July Cup, Gr.1, Royal Ascot Golden Jubilee S., Gr.1-twice, Deauville Prix Maurice de Gheest, Gr.1, Newbury Carnarvon S., L, Haydock Bet Totepool at Totesport.com S., 3d Newmarket July Cup, Gr.1, York Duke of York S., Gr.2. EUROPA POINT (07f, Woodman, Shareef Dancer). 9 wins from 1400m to 2000m, R2,335,650, Turffontein Empress Club S., Gr.1, Champions Challenge, Gr.1, Acacia H., Gr.3, Citizen Racing Express H., Price n Pride H., Full Spectrum Mobility H., Vaal Computaform Express H., 2d Turffontein Sojo H., 3d Vaal Play Soccer 6 H.
SAMITAR (09f, Rainbow Quest, Green Desert). 6 wins-2 at 2-from 6f to 9f, £277,739, €174,000, US$489,000, Irish One Thousand Guineas, Gr.1, Belmont Garden City S., Gr.1, Royal Ascot Albany S., Gr.3, Belmont Fairy Garden S., L, Saratoga Speed Boat S., L, Newmarket Tattersalls Millions 2YO Fillies' Trophy, 2d Keeneland Jenny Wiley S., Gr.1, Newmarket Fillies' Mile, Gr.1, Gulfstream Park Honey Fox S., Gr.2, Newmarket Tattersalls Millions 2YO S., 3d Saratoga Lake George S., Gr.2, Doncaster May Hill S., Gr.2, Belmont Athenia S., Gr.3, Newmarket Chemtest British Stallion Studs 2YO Fillies' S., 4th Saratoga Diana S., Gr.1, Keeneland Queen Elizabeth II Challenge Cup, Gr.1, Royal Ascot Coronation S., Gr.1, Pimlico Gallorette H., Gr.3. GIBRALTAR POINT (14c, Nugget Point, Thundering Force). 4 wins-2 at 2-at 1400m, 1600m to 2017-18, Cidade Jardim G.P. Ipiranga, Gr.1, G.P. Farwell, Gr.1, G.P. Presidente da Republica, Gr.2, 2d Cidade Jardim G.P. Governador do Estado, Gr.2, G.P. Presidente Jose Cerquinho de Assumpcao, Gr.3, 4th Cidade Jardim G.P. Presidente do Jockey Club, Gr.2, G.P. Presidente Jose de Souza Queiroz, Gr.3. PRINCE GIBRALTAR (11c, Pennekamp, Nureyev). 4 wins-2 at 2-from 1600m to 2400m, £10,760, €791,760, Baden-Baden Grosser Preis von Baden, Gr.1, Criterium de Saint-Cloud, Gr.1, Saint-Cloud Prix Greffulhe, Gr.2, Maisons-Laffitte Prix Commandeur, 2d Longchamp Grand Prix de Paris, Gr.1, Munich Grosser Preis von Bayern, Gr.1, Grand Prix de Chantilly, Gr.2, 3d Chantilly Prix du Jockey Club, Gr.1, Deauville Prix Guillaume d'Ornano, Gr.2, York S., Gr.2, Chantilly Prix de Villebon. MOUNT NELSON (04c, Selkirk, Forty Niner). 3 wins-2 at 2-from 1400m to 2000m, £291,180, €170,608, US$99,000, Saint-Cloud Criterium International, Gr.1, Sandown Eclipse S., Gr.1, Curragh Charlie Keatley Memorial 2YO S., 3d Arlington Million S., Gr.1, Chantilly Prix du Chemin de Fer du Nord, Gr.3. EAGLE MOUNTAIN (04c, Darshaan, Thatch). Champion 3YO in Ireland in 2007 (Int. ).5 wins-2 at 2-from 1200m to 2000m, £452,084, €337,287, US$600,000, NZ$7,500, HK$12,060,000, 80,960Dhs, Cathay Pacific Hong Kong Cup, Gr.1, Curragh Beresford S., Gr.2, Royal Whip S., Gr.2, Newmarket Joel S., Gr.3, Curragh Boylesports S., 2d The Derby, Gr.1, Breeders' Cup Turf, Gr.1, Newmarket Champion S., Gr.1, Curragh Futurity S., Gr.2, York Champagne S., Gr.2, York S., Gr.2, Meydan CBD Worldmaster Card S., 3d Irish Derby, Gr.1, 4th Newbury Racing Post Trophy, Gr.1, Manawatu RC Awapuni Gold Cup, Gr.2. SEVENTH ROCK (04c, Rubiton, Alert). 6 wins-2 at 2-to 1200m, A$2,250, R864,750, Scottsville Gold Medallion S., Gr.1, Turffontein Tommy Hotspur H., Gr.3, Pinnacle P., 2d Turffontein South African Nursery P., Gr.2, Vaal PSL Soccer 6 H., 3d Turffontein Computaform Sprint H., Gr.1. QUARTETO DE CORDAS (14g, Punk, Combé). 5 wins-2 at 2-from 1000m to 2200m to 2017-18, Gavea G.P. Brasil, Gr.1, G.P. Jose Buarque de Macedo, Gr.3, Copa Leiloes Jockey Club Brasileiro - ACPCCRJ - Versao Potros, Prova Especial Roi Normand, 2d Gavea Copa ABCPCC Mathias Machline, Gr.1, 3d Gavea G.P. Estado do Rio de Janeiro, Gr.1, Classico Ernani de Freitas, L, Copa Leiloes Jockey Club Brasileiro, 4th Gavea Classico Itajara, L.
ADMIRAL (13c, Catienus, Dixieland Band). 3 wins-2 at 2-from 1200m to 1700m, Club Hipico Clasico Polla de Potrillos, Gr.1, Clasico Alvaro Covarrubias, Gr.3, Premio Sam Act, 2d Club Hipico Clasico Alberto Vial Infante, Gr.1, 3d Club Hipico Clasico Luis Subercaseuax E, L.
ROCK KINGDOM (05g, St Covet, Taj Rossi). 6 wins from 1200m to 1600m, A$980,000, AJC Epsom H., Gr.1, Cross Swords H., STC Staffing Solutions H., City Tatt's RC Better Bet With a Bookie H., 2d AJC Randwick Guineas, Gr.1, STC Theo Marks H., Gr.2, GCTC Magic Millions 3YO Trophy, RL, STC Christmas Cup, L, Canberra Cup, L, 3d STC Rosehill Guineas, Gr.1, MRC Toorak H., Gr.1, AJC Tattersalls Club Cup, L, STC Frantelle H., 4th MVRC Crystal Mile H., Gr.2, Seymour Cup, L.
BRILLO DE SOL (13c, Jade Hunter, Storm Bird). 5 wins-1 at 2-from 1200m to 2000m to 2018-19, Club Hipico Clasico Nacional Ricardo Lyon, Gr.1, Clasico Juan Cavieres M., Premio Gold Ray, 2d Club Hipico Clasico Otoño, Gr.2, Clasico Luis Subercaseuax E, L, Clasico Carlos Cousiño S., 3d Club Hipico Clasico Asociacion Gremial de Preparadores CHS, Clasico Dorticos, Clasico I Municipalidad de Estación Central, 4th Club Hipico Clasico El Ensayo, Gr.1, Clasico Alberto Vial Infante, Gr.1, Clasico Criadores Machos, Gr.2. VARENAR (06c, Mr. Prospector, Spectacular Bid). Champion 3YO Miler in France in 2009.4 wins-1 at 2-from 1400m to 1600m, £5,400, €246,525, Longchamp Prix de la Foret, Gr.1, Saint-Cloud Prix Birum, 2d Longchamp Prix de la Porte Maillot, Gr.3, Prix du Pin, Gr.3, 3d Saint-Cloud Prix Nino, Longchamp Prix de Fontenoy, 4th Deauville Prix Maurice de Gheest, Gr.1, Cologne Silberne Peitsche, Gr.3. CASCADA SUREÑA (13f, Stuka, Stagecraft). 3 wins-1 at 2-at 1600m, 1700m, Club Hipico Clasico Polla de Potrancas, Gr.1, 2d Club Hipico Clasico Carlos Valdés Izquierdo, Gr.3, 3d Club Hipico Clasico Criadores Dorama, Gr.2, Premio Capeadora. GIBRALTAR BLUE (07f, Bluebird, Kris). 7 wins-1 at 2-from 1000m to 1600m, £4,296, €9,328, R1,027,750, Greyville KRA Fillies Guineas, Gr.2, Turffontein Ipi Tombe Challenge, Gr.2, Greyville Tibouchina S., Gr.2, Turffontein Johannesburg Spring Challenge, Gr.3, Gardenia H., L, Mr A R Sparrow Progress P., 2d Scottsville South African Fillies Sprint S., Gr.1, Turffontein Merchants H., Gr.2, Vaal Peermont Emperors Palace Charity Mile S., 3d Kenilworth Majorca S., Gr.1, Turffontein Soccer 6 P., 4th Newmarket Rockfel S., Gr.2. ARCETRI PINK (10f, Galileo, Star Watch). 6 wins-2 at 2-from 1000m to 1600m, R1,454,025, Turffontein Gauteng Fillies Guineas, Gr.2, Ipi Tombe Challenge, Gr.2, Pretty Polly S., Gr.3, Vaal Sophomore Fillies 1000, Turffontein Computaform Express Juvenile P., Itsarush.co.za S., 2d Turffontein Empress Club S., Gr.1, Pinnacle S., Magnum Mile Day P., 3d Greyville Garden Province S., Gr.1, Turffontein Magnolia H., Gr.3, Kenilworth Best Dressed Hat Competition P., 4th Greyville Golden Slipper, Gr.1, South African Fillies Classic, Gr.1, Turffontein Swallow S., L.
AJAXANA (11f, Lycius, Ahonoora). Champion Older Female Miler in Germany in 2015.4 wins-1 at 2-at 1600m, 1650m, €137,500, German One Thousand Guineas, Gr.2, Cologne Stutenpreis der Ilse und Heinz Ramm-Stiftung, L, Hannover Neue Bult Pokal, L, 2d Hannover Grosser Preis der VGH Versicherungen, Gr.2, Cologne Schwarzgold Rennen, Gr.3, 4th Baden-Baden Cup, L, Munich Dallmayr Coupe Lukull, L.
LOVETRISTA (04f, Sir Tristram, Sticks and Stones). 3 wins at 1400m, 2400m, NZ$189,200, Waikato Gold Cup, Gr.2, ARC Soliloquy S., L, Waikato RC James & Annie Sarten Memorial S., L, 2d Waikato RC Wentwood Grange 3YO H., 3d New Zealand One Thousand Guineas, Gr.1, Waikato RC Your Own Home H.
SEA OF HEARTBREAK (07f, Rainbow Quest, Dancing Brave). 6 wins-1 at 2-from 1450m to 2500m, Longchamp Prix de Royallieu, Gr.2, Newbury Chalice S., L, Tadley Tigers H., 2d Newmarket Dahlia S., Gr.3, Warwickshire Oaks, L, 3d Newbury Arc Trial S., Gr.3, 4th Goodwood Nassau S., Gr.1, Newmarket Severals S., L, Godolphin S., L, Goodwood Festival S., L.
LA ROCKET (04g, Desert Sun, Star Way). 6 wins from 1200m to 2000m, A$517,642, MRC St George S., Gr.2, Seymour Spring Classic, L, MVRC SAJ Cater Care Group H., MRC Aus Corp Signage Cup, 2d VRC Johnnie Walker S., L, MRC (Mornington) Lord S., L, VRC Comedy King H., Foletti & Keane H., MVRC Curran Chemicals H., Gorski Truck & Trailer Engineering H., MRC Kilsherry H., Euclase H., Traralgon Cup, 3d MVRC Stanley Wootton S., Gr.2, Seymour Cup, L, VRC Skipton H., MRC BMW Melbourne H., Hussonet H., Hussonet at Arrowfield H., MVRC Mayfair Smallgoods H., 4th MVRC Crystal Mile H., Gr.2. PAMPELONNE (08g, Rory's Jester, Forest Glow). 5 wins to 1400m, A$822,660, ATC Shorts H., Gr.2, Gosford Guineas, L, Scone RC Inglis Guineas, ATC APN Spirit of Outdoor H., Free Entry Today H., 2d ATC Churchills Sports Bar H., Sportingbet H., 3d ATC Razor Sharp H., L, 4th MRC Schillaci S., Gr.2, VRC Straight Six H., L.
TANGOI (12g, Mutakddim, Roy). 12 wins to 1300m to 2018-19, Club Hipico Clasico Velocidad, Gr.2, 2d Hipodromo Chile Clasico Julio Serra Bandres. JESSY BELLE (10f, Elusive Quality, Bluebird). 8 wins from 1200m to 2000m, A$784,425, VRC Matriarch S., Gr.2, Leilani Series Final H., MRC Sportingbet.com.au H., MVRC TM Design Inglis Bonus H., VRC Leilani Series Heat H., MVRC Emsley Lodge H., Sportingbet H., 2d VRC Vintage Crop & the Curragh Racecourse H., MRC Bert Bryant H., Sportscover Insures VAFA P., PSC Insurance Brokers H., 3d VRC Blazer S., Gr.2, MRC Tristarc S., Gr.2, BRC Dane Ripper S., Gr.2, MRC How Now S., Gr.3, ATC Lord Mayor's Cup, L, SCTC Ascot H., L, MRC Ern Jensen Funerals H., MVRC Slickpix H., 4th VRC Let's Elope S., Gr.2, Frances Tressady S., Gr.3. EISHIN OSMAN (08c, Luhuk, Southern Halo). 5 wins-2 at 2-from 1400m to 3200m, 110,456,000¥, Hanshin New Zealand Trophy, Gr.2, 4th Tokyo NHK Mile Cup, Gr.1. ROCK ME BABY (05f, Highest Honor, Bering). 5 wins-1 at 2-to 1400m, A$343,650, AJC Light Fingers S., Gr.2, STC Bacardi Breezer 2YO P., AJC Riverview Hotel H., STC Summer Racing H., Rosehill Event Centre H., 2d AJC Gimcrack S., L, 4th AJC Sweet Embrace S., Gr.3. BOOK OF KELLS (04g, Scenic, Best Western). 5 wins from 1550m to 2000m, A$138,350, 125,481Rgt., S$1,350, STC Tulloch S., Gr.2, March H., 3d AJC Lawn Party H.
BELLE DE CRECY (09f, Cape Cross, Great Nephew). Champion Older Female in Ireland in 2013 (Long).3 wins at 9f, 1¼m, £114,624, €111,695, Curragh Blandford S., Gr.2, Kilsaran International H., 2d Ascot British Champions Fillies' & Mares' S., Gr.1, Gowran Park Hurry Harriet S., L, Clairefontaine Prix Luth Enchantee, L, Leopardstown Irish Stallion Farms Fillies S., 4th Leopardstown Enterprise S., Gr.3. RAYDARA (12f, Marju, In the Wings). 2 wins at 2, €106,185, Curragh Debutante S., Gr.2, Leopardstown Irish Stallion Farms Median Auction 2YO S., 2d Leopardstown Desmond S., Gr.3, 4th Leopardstown Matron S., Gr.1, Curragh Kilboy Estate S., Gr.2, Leopardstown Silver Flash S., Gr.3. PERANA (07g, Palace Music, Ahonoora). 2 wins-1 at 2-at 1600m, 1800m, R419,325, Turffontein Victory Moon S., Gr.2, 2d Turffontein Courier Guy H., Racing Express P., Computaform Express P., 3d Turffontein Ernest & Muriel Preddy Memorial ER Associates S., 4th Kenilworth Cape Guineas, Gr.1. KITTY MATCHAM (05f, Sadler's Wells, Master Derby). 2 wins at 2, Newmarket Rockfel S., Gr.2, 4th Leopardstown Desmond S., Gr.3. EBIYZA (10f, Selkirk, Sadler's Wells). Winner at 2500m, €172,450, HK$300,000, Longchamp Prix de Royallieu, Gr.2, 3d Saint-Cloud Prix Joubert, L.
TRES ROCK DANON (06c, Monsun, Gay Fandango). Champion Older Male Stayer in Germany in 2011.9 wins from 2100m to 3200m, €289,638, Hamburg Rossmann Rennen, Gr.3, Krefeld Grosser Ehrmann Steher Cup, Gr.3-twice, Mülheim Silbernes Band der Ruhr, L, Hamburg Dresden Pokal, L, 2d Longchamp Prix du Cadran, Gr.1, Hoppegarten Oleander Rennen, Gr.2, Saint-Cloud Prix Denisy, L, Prix Scaramouche, L, Cologne Silbernes Band des Rheinlandes, L-twice, 3d Saint-Cloud Prix Denisy, L, Baden-Baden Mercedes-Benz Steherpreis, L, Saint-Cloud Prix Balbo, 4th Longchamp Prix de Barbeville, Gr.3, Dortmund Deutsches St Leger, Gr.3, Hoppegarten Oleander Rennen, Gr.3, Deauville Prix du Carrousel, L, Milan Coppa d'Oro di Milano, L, Hamburg Preis der Zehnjahrigen Partnerschaft PMU, L.
GOLDEN ARCHER (08c, Pins, Christmas Tree). 8 wins-5 at 2-to 1200m, A$676,950, MRC HDF McNeil S., Gr.3, VRC Streets Ice Cream S., L, MRC Heath S., L, MVRC St Albans S., L, TTC Gold Sovereign S., L, VRC Western Health Sponsors 2YO P., Monjon Australia H., MRC Sportingbet 2YO P., 2d MRC Schillaci S., Gr.2, VRC Aurie's Star H., Gr.3, 50 Years Fashions on the Field S., L, MRC Vain S., L, 3d VRC Lightning S., Gr.1, MRC Blue Diamond Preview (c&g), L, 4th ATC Pago Pago S., Gr.2, MVRC Ian McEwen S., Gr.3. GAMBLE ME (04f, Pleasant Tap, Mr. Prospector). 6 wins-1 at 2-at 1100m, 1200m, A$469,120, MRC Thoroughbred Club S., Gr.3, STC Birthday Card S., Gr.3, VRC Red Roses S., L, Moomba P., L, STC Konica Minolta 2YO H., MRC New Litho H., 2d AJC Keith Mackay H., L, 3d MRC Schillaci S., Gr.2, STC Magic Night S., Gr.2, MRC Merson Cooper S., L, VRC Hoppers Crossing 2YO H., 4th STC Starlight S., L.
STARLISH (05c, Anshan, Busted). 7 wins-1 at 2-from 1400m to 2400m, €288,480, HK$400,000, Lyon-Parilly Prix Andre Baboin, Gr.3, Saint-Cloud Prix Francois Mathet, L, Prix de la Porte de Madrid, L, Longchamp Prix Samos, Saint-Cloud Prix Val de Loir, Prix Hauban, 2d Longchamp Prix Hocquart, Gr.2, La Coupe de Longchamp, Gr.3, Saint-Cloud Prix Exbury, Gr.3, Maisons-Laffitte Prix Jacques Laffitte, L, Lyon-Parilly Prix du Grand Camp, L, 3d Grand Prix de Compiegne, L, Deauville Prix de Marolles, 4th Deauville Prix Gontaut-Biron, Gr.3. SWEETER STILL (05f, Belmez, Caerleon). 5 wins from 6½f to 1m, €2,325, US$308,376, Hollywood Park Senorita S., Gr.3, Santa Anita China Doll S., L, Del Mar Sandy Blue H., L, Delaware Park Light Hearted S., L, 2d Santa Anita Providencia S., Gr.2, 3d Hollywood Park Honeymoon H., Gr.2, 4th Hollywood Park Flawlessly S., L, Curragh Flame of Tara S., L.
ASLANA (07f, Royal Academy, Surumu). Champion Older Female Sprinter in Germany in 2011.4 wins-1 at 2-from 1300m to 1600m, €98,400, Hamburg Wenatex Europa, Gr.3, Frankfurt Fruhjahrspreis der Stadt Frankfurt Am Main, L, Düsseldorf Preis der HSBC Trinkaus, L, 2d Baden-Baden Kronimus Rennen, L, Bremen Walther J Jacobs Stutenpreis, L, Hoppegarten Pfingst Stutenpreis, L, Düsseldorf Preis der Dreijahrigen, L, 3d Baden-Baden Cup, L, 4th Cologne Silberne Peitsche, Gr.3, Hamburger Flieger Trophy, Gr.3. CELTIC ROCK (09c, Celtic Swing, Caerleon). Champion Imported Grass Male in Spain in 2013.11 wins-1 at 2-from 1300m to 2200m, €209,400, Bordeaux Prix Andre Baboin, Gr.3, Grand Prix de Marseille, L, 2d Copa de Oro de San Sebastian, L, 3d Madrid Premio Cimera, 4th Longchamp La Coupe, Gr.3. PROART (04c, Nomrood, Call Report). 9 wins-1 at 2-from 1200m to 1600m, A$494,150, WATC AJ Scahill S., Gr.3, Bunbury S., L, WATC Lord Mayor's Cup, Ledge Finance H., Pago Magic H., Air & Water H., Lindemans H., Don Kent 30 Years 2YO H., Neville & Carolyn Parnham H., 2d WATC Summer Scorcher H., L, York S., L, Carbine Club of WA S., L, Challenge S., L, Pink No-Touch H., Belinda's Star H., Bali Recovery Project H., 3d WATC TJ Smith Trophy, L, Australia Day Cup, Go For 2 & 5 H., D'Orsogna Ltd H., 4th WATC AJ Scahill S., Gr.3. SPOIL THE FUN (09c, Night Shift, Nodouble). 8 wins-2 at 2-from 1500m to 1850m, €296,400, 27,525Dhs, Milan Premio del Piazzale, Gr.3, Longchamp Prix de Montretout, L, Deauville Prix du Saubouas, Prix Abdos, 2d Saint-Cloud Prix du Muguet, Gr.2, Chantilly Prix Bertrand du Breuil, Gr.3, Deauville Prix Quincey, Gr.3-twice, La Teste Prix Millkom, L, 3d Deauville Prix Quincey, Gr.3, Düsseldorf Frühjahrs Meile, Gr.3, Chantilly Prix du Ranelagh, L, Toulouse Grand Criterium du Languedoc, L, Vichy Prix Jacques de Bremond, L, 4th Marseille Borely Prix Georges Trabaud, L, Toulouse Prix Aymeri de Mauleon, L.
JALLOTA (11g, Fraam, Mujadil). Champion Older Male Miler in Italy in 2016.7 wins-1 at 2-to 1400m to 2018, £267,308, €128,535, 111,018Dhs, Chantilly Prix du Pin, Gr.3, Redcar Guisborough S., L, York JCB S., Titanbet.co.uk S., Haydock Bill Rothwell Memorial S., Newmarket Animal Health Trust 2YO S., Kempton 32red S., 2d Milan Premio Vittorio di Capua, Gr.1, Deauville Prix de la Porte Maillot, Gr.3, Haydock John of Gaunt S., Gr.3, Newbury Dubai Duty Free Cup, L, Meydan Classic S., L, Goodwood 888sport S., Newmarket Tattersalls Millions 2YO Trophy, Chester Matthew Clark H., Doncaster Racing Post Members' Club S., 3d Newmarket Challenge S., Gr.2, Joel S., Gr.2, July S., Gr.2, Sandown Mile S., Gr.2, York City of York S., Gr.3, Goodwood Supreme S., Gr.3, Chester City Plate S., L, York Yorkshire Regiment 2YO S., 4th Deauville Prix Morny, Gr.1, York City of York S., Gr.3, Curragh Anglesey S., Gr.3, York Ganton S., L, Newbury Dubai Duty Free Cup, L, Newmarket Ben Marshall S., L.
ROMANTIC WAVE (09c, Indian Ridge, Bound for Honour). 7 wins-1 at 2-from 1800m to 2400m, €147,696, Rome Premio Carlo d'Alessio, Gr.3, Premio Signorino, L, Milan Premio Carlo Porta, Premio Mario Locatelli, Rome Premio Campidoglio, Premio Sirlad, Premio Stufida, 2d Milan Premio Merano, L, Rome Premio Conte Felice Scheibler, L, Milan Premio Citta' di Noceto, Premio Vedano Al Lambro, Rome Premio Federico Smith, 3d Gran Premio di Milano, Gr.1, Milan Premio Campobello, L, Rome Premio Godetia, 4th Milan Premio Federico Tesio, Gr.2, Premio Marchese Giuseppe Ippolito Fassati, L.
SOLID BILLING (04g, Star Way, Grosvenor). 7 wins from 1600m to 3200m, NZ$88,677, A$236,700, AJC Summer Cup, Gr.3, BRC Queensland Cup, L, ARC Nathans Memorial H., 2d Taranaki RC Wahid H., Waikato RC Vision Forest Lake H., 3d ATC Sydney Cup, Gr.1, Counties Cup, Gr.2, Cambridge JC Presland Tocker Insurance H., ARC Stella Artois H., 4th ATC Summer Cup, Gr.3. WORDLESS (12f, Hernando, Caerleon). 6 wins-1 at 2-from 1700m to 2200m, €112,642, Milan Premio Verziere, Gr.3, Premio Paolo Mezzanotte, L, Premio Alberto Zanoletti di Rozzano, Premio Baggio, Premio Altaguardia, Rome Premio Forze Armate Qatar, 2d Rome Premio Archidamia, L, Premio Buontalenta, L, Merano Premio Terme di Merano, L, Rome Premio Don II, Milan Premio Monza, 4th Merano Premio Terme di Merano, L.
ROCK OF ROMANCE (10c, Indian Ridge, Alleged). 5 wins from 2400m to 3200m, €95,281, 33,600sFr, Milan St Leger Italiano, Gr.3, Hamburg Langer Hamburger, L, Deauville Prix du Mont Lion, Avenches St. Leger Suisse, 2d Milan St Leger Italiano, Gr.3, Hoppegarten Oleander Rennen, Gr.3, 3d Dortmund Deutsches St Leger, Gr.3, Swiss Derby, Saint-Cloud Prix la Varende, 4th Milan St Leger Italiano, Gr.3, Dortmund Deutsches St Leger, Gr.3, Hoppegarten Oleander Rennen, Gr.3, Hamburg Langer Hamburger, L.
GENUINE DEVOTION (04f, Black Tie Affair, Lyphard). 5 wins-1 at 2-at 6f, 1m, US$275,725, Churchill Downs Locust Grove H., Gr.3, Belmont Xtra Heat H., L, Upper Noosh S., L, Allowance. MAGIA PARA TODOS (13f, Proud Citizen, Schossberg). 4 wins at 1600m, 1900m to 2017-18, Valparaiso Clasico Alfredo LS Jackson, Gr.3, Clasico Alberto Solari Magnasco, L, 2d Club Hipico Premio Tarde Primaveral, 3d Club Hipico Clasico Carlos Campino L, Gr.2, Clasico Nacional Milla Hembras, Premio Familia Feliz, 4th Club Hipico Clasico Jorge Baraona Puelma, L.
ROCKINANTE (09g, Night Shift, Acatenango). 4 wins-3 at 2-from 1200m to 1600m, Newmarket Autumn S., Gr.3, Deauville Prix Francois Boutin, L, 2d Goodwood Vintage S., Gr.2, Epsom Bordeaux Fine Wines S., 4th Newmarket Royal Lodge S., Gr.2, Maisons-Laffitte Prix Djebel, Gr.3. ATYEB (06c, Mr. Prospector, Blushing Groom). 4 wins from 1600m to 2850m, R378,400, Turffontein Caradoc Gold Cup, Gr.3, Aquanaut H., L, Vaal Bridgestone Retail H., 2d Vaal Sascoc Triple Crown S., 3d Turffontein Racing Association H., Gr.3, Velotex H., Support the Horse Care Unit H.
HIGH ROCK (05c, Alysheba, Nureyev). 3 wins-2 at 2-from 1600m to 2000m, €179,300, Longchamp Prix de Conde, Gr.3, Prix la Force, L, Saint-Cloud Prix Caro, 3d Deauville Prix de Crevecoeur, 4th Chantilly Prix du Jockey Club, Gr.1. ROCK OF ROCHELLE (05c, Wild Again, Seattle Slew). 3 wins-2 at 2-at 6f, £12,198, €121,294, Curragh Renaissance S., Gr.3, Blenheim S., L, Mencap 2YO S., 2d Baden-Baden Badener Sprint Cup, Gr.3, Curragh Racing South Africa 2YO S., 3d Baden-Baden Badener Sprint Cup, Gr.3, Royal Ascot Wokingham H., 4th Tipperary Concorde S., Gr.3. YELLOWSTONE (04c, Exclusive Era, King Emperor). 3 wins-1 at 2-from 1m to 1¾m, £147,464, €69,148, US$5,000, Goodwood Gordon S., Gr.3, York Silver Cup, L, 2d York Great Voltigeur S., Gr.2, Leopardstown Derrinstown Stud Derby Trial S., Gr.2, 3d Saint-Cloud Criterium International, Gr.1, Royal Ascot King Edward VII S., Gr.2, Newbury Totesport Newburgh H., 4th Sandown Eclipse S., Gr.1, Newmarket Fred Archer S., L, York Grand Cup, L.
SLIDING CUBE (04f, Canny Lad, Nijinsky). 3 wins-2 at 2-to 1200m, A$179,625, AJC San Domenico S., Gr.3, Keith Mackay H., L, Picton Bowling Club H., 2d AJC Light Fingers S., Gr.2, 4th AJC Surround S., Gr.2. CORAL WAVE (09f, Rainbow Quest, Shirley Heights). 2 wins at 2, €86,755, Curragh Park S., Gr.3, Flame of Tara S., L, 2d Curragh Loder 2YO Fillies S., 3d Leopardstown Derrinstown Stud One Thousand Guineas Trial, Gr.3. MURTAJILL (04c, At Talaq, Raffindale). 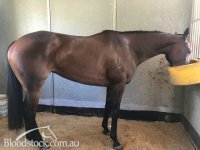 2 wins at 2, A$646,375, AJC Skyline S., Gr.3, 1200m-in track record time, Breeders' P., L, 2d AJC All Aged S., Gr.1, BTC Doomben Ten Thousand S., Gr.1, STC Hobartville S., Gr.2, 3d VRC Gilgai S., Gr.2, STC Silver Slipper S., Gr.2, AJC Eskimo Prince S., L, 4th STC Golden Slipper S., Gr.1, AJC Sires' Produce S., Gr.1, MRC Sir Rupert Clarke S., Gr.1, HDF McNeil S., Gr.3. RELAMPAGO GIGANTE (13c, Stagecraft, Proposal). 15 wins-1 at 2-from 1200m to 2000m to 2018-19, Clasico Valparaiso Sporting, Gr.3, Club Hipico Premio Haras Carioca. WAR STORY (10g, Nashwan, Barathea). 6 wins-3 at 2-from 1400m to 1600m, Baden-Baden Zukunfts Rennen, Gr.3, Newbury Spring Cup, Newmarket Racing UK H., 3d Chester Archery H., Newbury Outward Bound Trust 2YO S., Kempton Betfred Goals Galore Extra H., 4th Curragh Railway S., Gr.2, Newmarket European Free H., L.
RICH GIRL (11f, Giant's Causeway, Scenic). 5 wins-2 at 2-to 1400m, R2,833,350, Clairwood Strelitzia S., Gr.3, Turffontein Emperors Palace Ready to Run Cup, Greyville Racing It's a Rush P., Natal Settlers Memorial Homes P., 2d Scottsville Allan Robertson Championship, Gr.1, Racing. It's a Rush S.
His sire sons include Mount Nelson (23), Seventh Rock, Society Rock, Red Rock Canyon, Murtajill, Varenar, Proart, etc. MURTAJILL is by the World Champion Racehorse and proven sire of sires ROCK OF GIBRALTAR. Also a ¾ brother to proven Group 1 sire BRADBURY'S LUCK, he hails from one of the best female families in the Australian Stud Book. His dam SKATING, a dual Group 1 winner has produced 3 Stakes winners and a further 4 Stakes performers at stud, including Skates – dam of the 2015 Golden Slipper winner VANCOUVER. Murtajill was a big strong yearling who matured early enough to compete at the elite level at two, running 3rd first up in the Silver Slipper G2 before winning the G3 Skyline stakes. He ran 4th in the Golden Slipper G1, beaten less than 1 length having been trapped wide from an outside barrier and 4th in the AJC Sires Produce G1. At three he ran second in the All Age Stakes G1 before running second in the Doomben 10,000 G1 to Apache Cat. A dual record-breaking 2YO, Murtajill was Timeform rated 120 at 2 and was the highest-rated 3YO colt of his generation in Australia with a Timeform rating of 125. 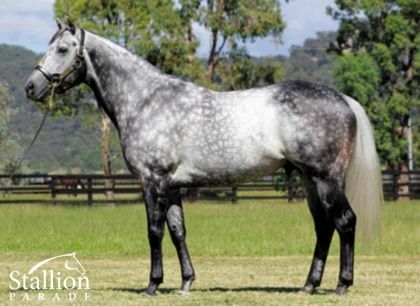 Beginning his stud career in the Hunter Valley, Murtajill’s early books lacked some of the quality of his Group 1 winning contemporaries (he himself finished 2nd at the elite level on two occasions), nonetheless he was a Leading First Season Sire and finished the 2013/14 season as #3 Second Season Sire table in Australia by number of winners. The two horses to finish above him were NORTHERN METEOR and SEBRING. Murtajill has sired 5 individual Stakes performers to-date, including the Stakes-winning sprinter SUNSHINE MIGHTY – Growing Grey. SUNCHINE MIGHTY is out of a Grey Sovereign-line mare and it is noteworthy that Murtajill has had 4 runners from this broodmare sire-line and all are winners. His progeny display early speed and precocity as evident in his daughter Girlsarebackintown who was Group 3 placed at 2. He is an extremely consistent source of winners and his progeny continue to have commercial appeal – his yearlings have sold for up to $145,000, his racehorses sold for up to $75,000, and his broodmare daughters sold for up to $80,000.